Welcome to Siem Reap, the charming gateway to the famed temples of Angkor. You will be greeted by your local English speaking guide, who will accompany you to your hotel for check in. Take a rest form your flight at the hotel or discover Siem Reap on a stroll through its beautiful pagodas and the colorful market on your own. This afternoon, will take you on a journey to get the first glimpse of the legendary Angkor Wat. Built during the rdeign of King Suryavarman II in the early 12th century, Angkor Wat is constructed following the model of the temple mountain symbolizing Mount Meru, the home of the gods. Inside the temple, the walls are covered with stone cavings and bas-reliefs depicting Hindu mythology and the wars Suryavarman II fought during his reign. Angkor Wat is well known for the more than 2,000 Apsara dancers decorating temple. Construction is thought to have take around thirty years of intensive labor. Today, Angkor Wat is figured on Cambodia’s national flag as the temple symbolizes the soul of the Khmer people. Overnight in Siem Reap. After breakfast, visit the ancient city of Angkor Thom, the last capital of the Great Khmer Empire under the reign of Jayavarman VII. This city is surrounded by an 8 m high wall drawing a perfect square. Enter the city through the ancient South Gate, an impressive stone gate carved with Elephants and four giant faces. On each side of the entrance path a row of 54 gods of demons is holding the sacred Naga snake. From here, continue to Bayon Temple in the exact center of the city. 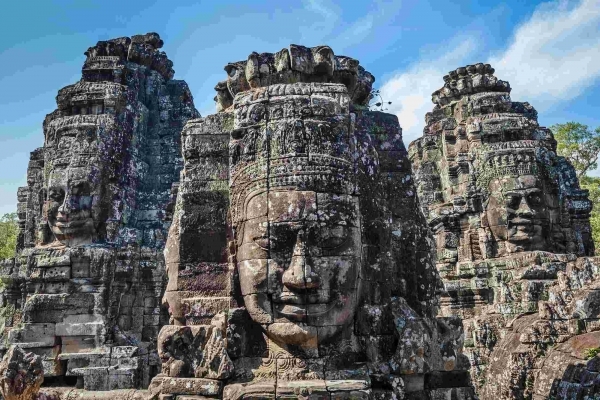 This 12th century masterpiece is a study in grandeur and is well-known for its 54 towers with enigmatic faces representing the 54 provinces of the Great Khmer Empire. The Terrace of the Elephants and the Terrace of the Leper King are also must-visits as sthey are both known for their intricate bas-reliefs. Later today, travel to the gem of the Angkor area, the pretty temple of Banteay Srei, which is best viewed in the warm afternoon light. The so-called Citadel of the Women remains the best preserved temple in Cambodia. It displays some of the finest examples of classical Khmer art as this small temple is noted for its truly remarkable fine bas-reliefs. Banteay Srei is unique in that it is constructed of pink sandstone, which is seen nowhere else in Angkor. On the way back, peek into Banteay Samre temple. You will have the possibility to stop at local communities along the way and your guide will help you to interact with the local community to learn about the way of life here. Seize the opportunity to taste Palm Wine and Palm Sugar (seasonal) and other popular local produce. Stop at the Landmine Museum which promotes mine awareness. Mr.Aki Ra, the museum founder, was trained as a child soldier during the Khmer Rouge regime and is working today as a de-miner. The museum serves also as a rescue center for a number of landmine amputee children the Aki Ra has brought off Phnom Penhs streets or from impoverished rural communities. Overnight in Siem Reap. Breakfast at your hotel. 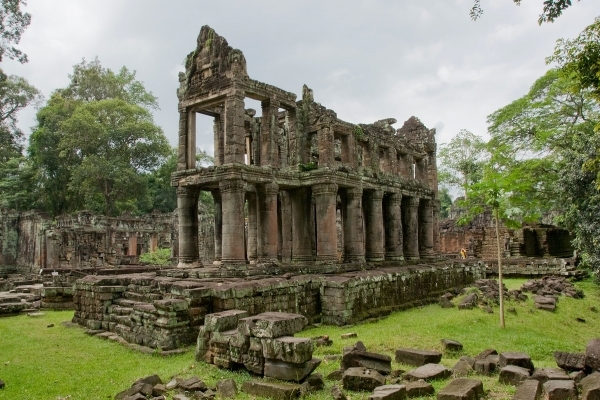 This morning, enjoy a visit to the temples of the Grand Circuit, starting at Preah Khan Temple. This temple was built approximately during the same period as Ta Prohm, and originally served both as a religious university and a temple. Continue to Neak Pean, which is unique because it is not a temple but a sanctuary placed in the center of an artificial lake and connected to four surrounding ponds exactly at cardinals points. Your final visit will be to the small temple of Ta Som, a Buddhist temple built under Jayavarman VII. Around noon, break up your day with lunch at Sala Bai back in Siem Reap, a school training young Cambodians from poor family backgrounds in the principles of hospitality in order to give them a future. You will have plenty of opportunities to talk to the students as they will go on a tour of the school after the meal. 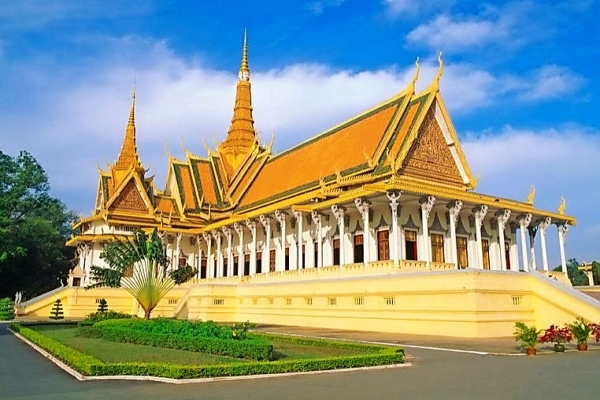 (Note: Sala Bai is usually closed during national holidays and for the entire of April over the Khmer New Year holiday). This afternoon, explore the temples of the Small Circuit by a local tuk tuk. The most illustrious among these is Ta Prohm temple, built in the mid 12th to early 13th centuries. Ta Prohm is unique in that it has been left largely as it was found: overgrown by jungle trees and vines, with many parts of the temple crumbling to the ground. This makes the Tomb Raider Temple one of the most picturesque and memorable of the Angkor temples. Your visit will also include Banteay Kdei, a Buddhist monastery from the late 12th century, and Srah Srang, also known as the pool of ablutions. Enjoy a view of the sunset over the Angkor ruins at one of the temples. Overnight in Siem Reap. After an early breakfast, embark on a boat trip that will take you on a fascinating journey across Tonle Sap Lake to Battambang on a private boat. 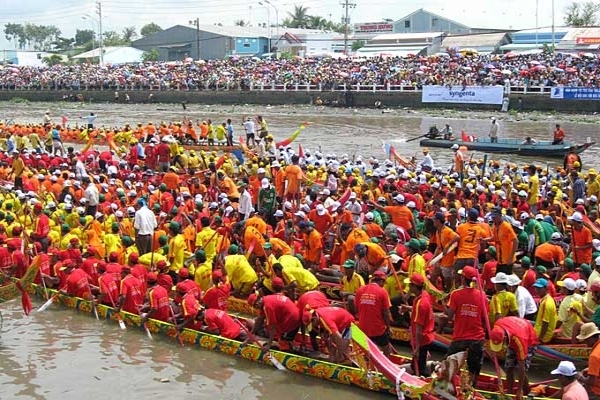 You will pass floating villages and fooded forests, portraying life on this body of water that forms Cambodia’s heart. Packed lunch will be served on board. 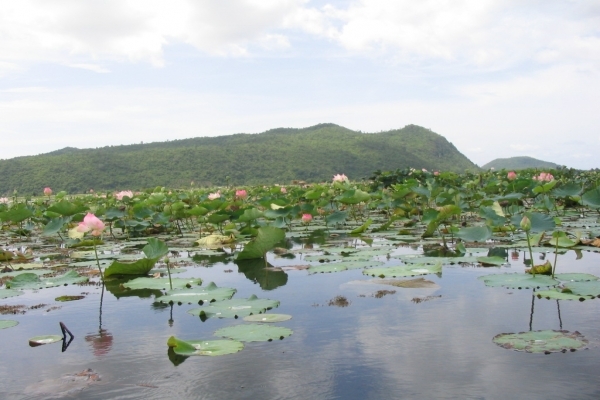 (Note: this boat is only possible in the high water period from July to December as water levels are too low during the dry season and transfer times can be extremely long. From January to June alternative transfer by road). Tonight, a special visit awaits you at Phare Ponleu Selpak. School of Musiv, Visual and Performing Arts – Phare Ponleu Selpak combines the Arts to provide education, support and entertainment to the poor communities. This project is a success story of how humanitarian aid work can turn into a display of zest for life, genuine warmth and creativity, against all odds. 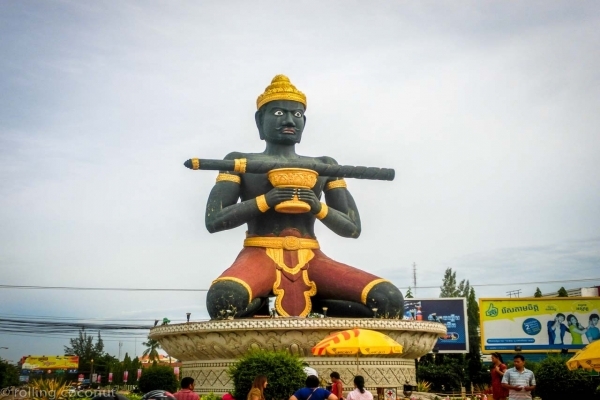 A visit to one of their circus shows will leave you with a lasting memory of the wonderful Cambodian people and should not be missed when in Battamband! After the show, a dinner will be waiting for you at the center. (Note: The circus performance is only performed regularly on each Monday & Thursday. On the days private performances are available on request and for a supplement). Overnight in Battambang. Today have a fun morning cycling around local villages with Soksa Bike, a social enterprise initiated set up to provide scenic and informative bike rides through the local countryside. During the 30km cycle tour there are plenty of stops where you will learn how the locals produce rice paper, prahoc (typical Cambodian fish paste), grolan (sticky rice stuffed in bamboo) and other Cambodian treats. The local countryside is beautiful and the Battambang area is known for the high quality rice and also oranges grown in the area. In the afternoon explore another side of Battambang. Take a relaxing cyclo ride around the town with an audio set providing an informative guide to the history of the town. Over 2 half hours sit back as your cyclo driver takes you around the colonical streets, markets and temples. The audio set narrates short anecdotes of the many highlights in English of French. At many you get off the cyclo and walk around the points of interest before moving on the next stop. Overnight in Battambang. Breakfast at your hotel. Now you will head to the Bamboo Train station. The Bamboo Train has been set up by the villagers in order to facilitate the transportation of goods and persons as there are no regular running any more. The train itself is very basic: on bamboo platform on 4-wheels is activated by a small motor. Sitting on the platform (we will provide some cushions for your comfort), you will travel the 8 km to the next station through beautiful landscape and rice paddies (depending on season of visit). A true rollercoaster ride without loops. (Note: the train tracks from Battambang to Phom Penh are currently being rebuilt. The long term future of the bamboo train ride cannot be guaranteed. Should the service stop we will arrange alternative sightseeing). This afternoon, you will be transferred back overland to Siem Reap (Duration 3 hrs). Upon arrival, check in to your hotel. Overnight in Siem Reap. Breakfast at your hotel. Enjoy the day at leisure for some relaxation at some more sightseeing or for some personal shopping on Siem Reaps colorful markets. For example, visit Artisans Angkor, established in 1992 in order to support Cambodian arts and crafts, and to help young people find work in their local villages by continuing the practice of traditional arts. Discover how wood and stone carvings, lacquering, gilding and silk paintings are created. 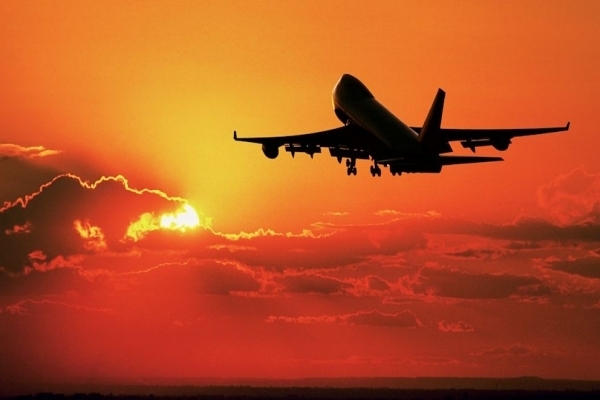 Transfer to the airport for your individual flight.